Flavoursome, crunchy, and noodle-like sev is one of the inevitable titbits to grace any festive tray – filled with several other delish treats. This authentic namkeen – which has its roots in Madhya Pradesh – is so versatile that it can be served as simple standalone bites or as toppings over poha, misal pav, and all kinds of chaat. You can even use them in several recipes to transform your dishes into something even more yummy. Prepared through authentic methodologies, our gamut of sev variants brings you original flavours from various regions across India. So sought-after are these snacks that many of them have made it to the top of our best-selling list. If you want to try out a few as well, then check out these five bestseller Indian sev varieties on our website. Native to Ratlam in the Malwa region of Madhya Pradesh, Ratlami sev has an immense fan following owing to its blend of special spices – rendering it with a unique taste. 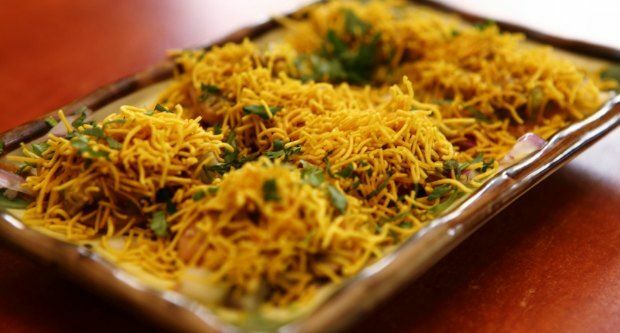 The fried and crusty namkeen is thicker than other sev variants, but lightweight – which makes it extremely addictive. You can savour the various avatars of the munchies from our inventory – be it from KPR Gold in Indore or Sukhadia Garbaddas Bapuji in Anand. All of these conventional delicacies promise you the exact traditional taste of oregional bites – curated through ancient recipes – without any compromise on quality or hygiene. No wonder, they had made it to our top list and have become a favourite among our buyers. The second smash hit in our chart is the delicious Ujjaini sev – synonymous to the city of Ujjain – famous for your childhood tales of Vikram and Betal. Usage of extensive spices and ingredients – that fire up your taste buds – is what sets this namkeen apart from others. You can relish our select sev from Prakash Namkeen or Agrawal’s Delight and get the snacks delivered all the way from Indore. Sprinkle a few of the sleek, spicy, and crispy strands over your dahi puri, rava upma, poha, sandwich, or chaat and be simply mesmerised by its unmatched taste. How about we introduce you to a unique concept where Maggi and sev come together for an awesome union? Yes, welcome the midnight hunger-pang saviour in an all-new avatar with the ingenious maggie sev. The spicy, crunchy, and salty noodles are usually prepared from ingredients such as potatoes, garlic, spices, and condiments. Offering you the zing of original Maggi, these bites should certainly be tried once! Also referred to as 'poondu karasev' in Tamil, 'lahsun sev' in Marathi, and 'velluli karapusa' in Telugu – this flavourful sev comes with a distinct taste due to the addition of garlic. The golden, crispy, and gram-flour-based snacks can be relished as standalone bites, along with a steaming cup of tea, or prepared with bhel puri and chaat. It is another bestseller in our list due to this characteristic and intense aroma, along with a warm flavour. This chatpata, peppery namkeen will simply leave you craving for more. It is an ideal, hot companion for your dinner when you want to eat something spicy. Yes, no pun intended. Add some onions and chopped vegetables to bring in some new, creative, flavours. So why wait? Start your own experiments now! The next chart-topper from our inventory is the extremely addictive Bikaneri sev. Packed in shiny foil packets, these namkeen taste as regal as the region from where they are sourced. Having a fan following – which is at par with the rasgulla of Bengal – Bikaneri sev is prepared from moth flour, gram flour, and select spices. The distinctive flavours of Rajasthan are highly prevalent in these masaledar, golden-yellow noodle-like strands. Add this sev to finely chopped onions as well as tomatoes with a sprinkle of lemon and you have your own version of exquisite chaat. Our luscious filler – Shyam Sundar Bikaneri Sev – is made using quality ingredients, authentic recipe, and up-to-date machines. We Indians find it hard to accept a plate of bland, plain, and simple food – spices and taste being engraved into our system. This is where sev came to our rescue. The desire for more innovative namkeen types gradually gave birth to multiple varieties of masaledar sev. Here, we have put down some of our variants that have been voted as one of the best by our customers. You can also check out our sev menu for your own favourite option.So, what’s the delay? Order now.